I was also invited by the Office to tell them something about the amount of the microwave energy coming from the Sun, eventually reflected by the earth, with regard to the possibility of resonant action on the micro-structure-grid of the razor blade edge. I proved, by scientific evidence, that with the help of the pyramidal resonant cavity, or by the bunching effect of a pyramid horn, this energy can be sufficient. I further proved that the energy needed for steel-crystal grid action on dislocations is only in the amount of 1 to 1.5 ev (electronvolts one electron volt representing the energy of 1.6 X 10-19 watts per second), which means that this energy is very low and can be easily overcome by spheric and technic action (microwaves, produced by technical devicgs in the hollow of the pyramid). See, for example, P. Fischer und Kochendorfer “Plastiche Eigenschaften von Kristallen (Kristallgittern) und metallischen Werkstoffen” (plastic characters of steel crystal grids). My hypothesis, elaborated for the Patent Office (I don’t affirm here that it is the only one possible) explains also why the regenerating pyramid should not be placed too near to room walls, greater metal masses, or to numerous electric devices (definitely not on television sets). In order to explain, on a simple level, how the pyramid works on the razor blade edge, I like to compare it to the photo exposure meter which, like the pyramid, acts without any artificial source of energy only with the impetus of visible sun light. The only difference between the two devices is that mine acts with an invisible sun light. The above comprises the main portion of my hypothesis for the Patent Office, the result of which was that at the end of “only” ten years of examination, and proof of real functioning provided by the chief examiner himself, the patent was issued. Upright to the wall of this model we found an elevation angle of 25°; this form represents a very good mummification pyramid, with great wall surface, which I called the Contra-Inclination Pyramid. With all these models I made a great number of mummifications, but for the razor-blade I prefer the Cheops model. In the No. 9, 1973 edition of the journal Esotera (BRD), on pp. 799-800, Hans Joachim Hohn confirms the functioning of the Cheops pyramid on razor blades, but proposes his own model with an elevation angle of 69° 20', base line 15 cm., height 22.2 cm., with which, he says, he obtained 196 very good shaves, using a Wilkinson-Sword blade. Traveling in Egypt, Mr. Bovis visited the Great Pyramid and found, in the Royal Chamber, which is one-third of the entire height of the pyramid, mummified animals. In an intuitional flash, Mr. Bovis deduced that the pyramid had powers of mummification and, upon his return home, reproduced scale models of the Great Pyramid, using scales of 1:1000 (15 cm. high) and 1:500 (30 cm. high), the base-fine calculated by multiplying the height by or approximately 1.57. Bovis was sure that his seemingly mad experiments with mummification would succeed without the help of any technical literature, physical reviews or other scientific data. For him the small pendulum of his own patented construction was sufficient. For Bovis it was easy to have the pendulum patented, since in France, unlike in Czechoslovakia, it is possible to obtain a patent without providing any technical explanation. As long as the invention is something new, it is not necessary to prove that it works! I first came across the name Antoine Bovis in a little radiaesthesic booklet in which appeared his different lectures, given in radiaesthesic circles of Nizza, about his (according to him) numerous, and especially his little “Special magnetic pendulum of Bovis”, which, he says, is the best of all. Following each paragraph, there was another “Law of radi- aesthesia action”, the only one possible, discovered by Bovis himself. 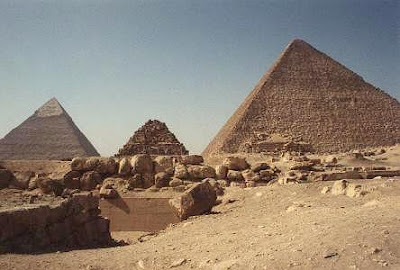 In one of his lectures, he spoke about his mummification experiments with Cheops’ pyramid cardboard models, because he had found in these models, with his pendulum, “the same radiations”, as in the King's Chamber of the Great Pyramid. Evidently, his models worked! .Dead organic matter, meat, eggs, and small dead animals were as perfectly mummified as were the animals he found in the Pyramid at Giza. Because it was relatively simple to ascertain if Bovis’ claims were fiction or reality, I constructed a Cheops model, 30 cm. high, in cardboard 3 mm. thick (scale 1:500) and, to my great astonishment,I, like Mr. Bovis, was able to create mummifications to repeat with success his mummification experiments mummifying beef, calf or lamb meat, eggs, flowers and even small dead reptiles such as frogs, snakes, lizards, etc. I began a correspondence with Mr. Bovis, informing him of my experiments. We exchanged some agreeable correspondence, although I felt that he was a little “too magic” for me, a radio-technician. He claimed to find with his pendulum radiations in everything he touched. And so began my razor-blade adventure with the 152 Cheops model. My assumption that the blade in the pyramid would lose its sharpness was false. Just the contrary occurred, and when I had shaved myself comfortably fifty times with the same blade, instead of the usual eight times, I was forced to admit that there was something very wrong in my supposition. My first razor-blade experiment was made with a Cheops type pyramid 15 cm. high (scale 1:1000), the blade was poised horizontally north-south on its longitudinal axis and one-third above the base; two sides of the pyramid were oriented in the same manner. Through numerous experiments I found that for this purpose a cardboard pyramid 8 cm. high, or a styreen pyramid 7 cm. high is sufficient. Years later this styreen model was fabricated by a plastic material factory, but only some hundreds of pieces were produced before they refused to continue the manufacture. Although I don’t know all the circumstances causing the refusal, I can speculate that perhaps a great factory of razor blades, distressed at the possibility of having a consumer use a single blade one hundred times or more, persuaded the plastic factory to discontinue manufacture of the item. Of course, it is very easy for anyone who wishes to do so to make this little pyramid. It is difficult for me to guess how many home-made pyramids exist in the U.S.S.R., but I can testify that of the thousands and thousands of users who have written me concerning the pyramid, not one has complained, but a great number have written with great enthusiasm. The last twenty-five years have been for me a long experimental sequence, with each shaving itself an experimental experience which has sometimes informed me, by unexpected changes in the sharpness of the blade, of some meteorological or cosmic disturbances. The blade edge in the pyramid is a “living entity,” in contact with the environmental field often after a day when I received a poor shave I was surprised the next day by receiving, from the same blade, an excellent shave. To judge the sharpness of the blade I have introduced a scale with six degrees: No. 6 = excellent, No. 5 = very good, No. 4 = good, No. 3 = sufficient, No. 2 = fair and No. 1 = insufficient. In the first five years and three months of my experiment (from March 3, 1949 to July 6, 1954) the average value of one blade was 105 daily shaves (using only eighteen blades of different brands) and I achieved as many as 200, 170, 165, 111 and 100 shaves with a single blade. In twenty-five years I used a total of sixty-eight blades. I have corresponded about this strange patent with experimenters in a number of countries in Europe, and also in the U.S.A., South America, Australia, New Zealand and Iceland! Great interest has also been expressed by researchers in the U.S.S.R. For example, in the Komsomolskaja Pravda of October 10, 1970, (and reprinted in the Moscow journal Heureka in 1973) Mr. Malinov, CSC., wrote an interesting article about, to use his expression, “a strange invention.” As a physicist, Mr. Malinov has formed a logical explanation of the functioning of the pyramid, by using electromagnetic theory combined with the earth’s magnetic field and also with the “Lorentz forces.” I have also learned that my little pyramid is, in home-made form, of customary use in the U.S.S.R.
My experimentation has led me to write some articles about the regenerating pyramid for popular science journals and other periodicals in Eastern Europe. I have also spoken on a radio broadcast and even appeared in a television interview. All of this publicity has brought me a very great number of friendly letters. In conclusion, I wish everyone who uses or will use this invention two hundred or more shaves with the same blade.